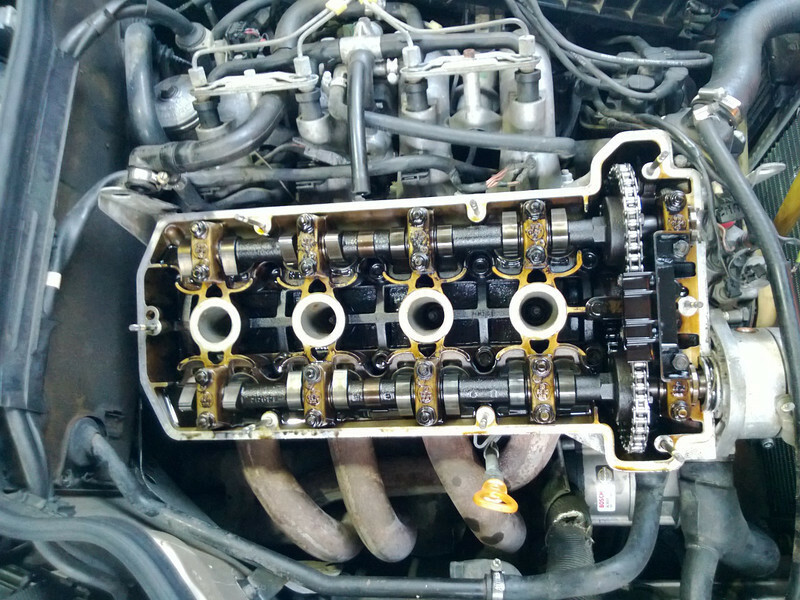 Why the hell are you having the head gasket replaced ? And it's the BALL JOINTS that need replaced. I gave you a brand new set. PLEASEEEEE don't have some hack shop mis-diagnose this car!!!!!! Quote: Originally Posted by Charlie Murphy! 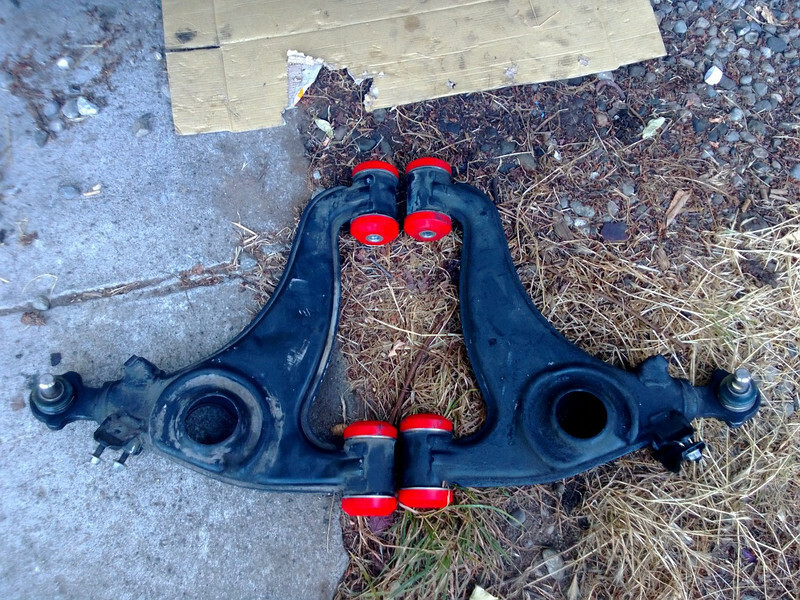 Car Tender did point out some torn boots and play in the tie rods, and the whole set isn't terribly expensive so it won't hurt to have that refreshed. I'll get those ball joints in while I'm working on the front. My bushings should be here in a little while...they were just shipped out last night. Spent some time with the car today. Installed the Bilstein shocks, new valve cover & gasket, and the SLS plug. Recovered a bunch of rusty paper clips and a couple random nuts and bolts from underneath the trunk liners. Shocks went in pretty easily, though I did have to deal with collecting the drippings from the SLS parts as I took them out. 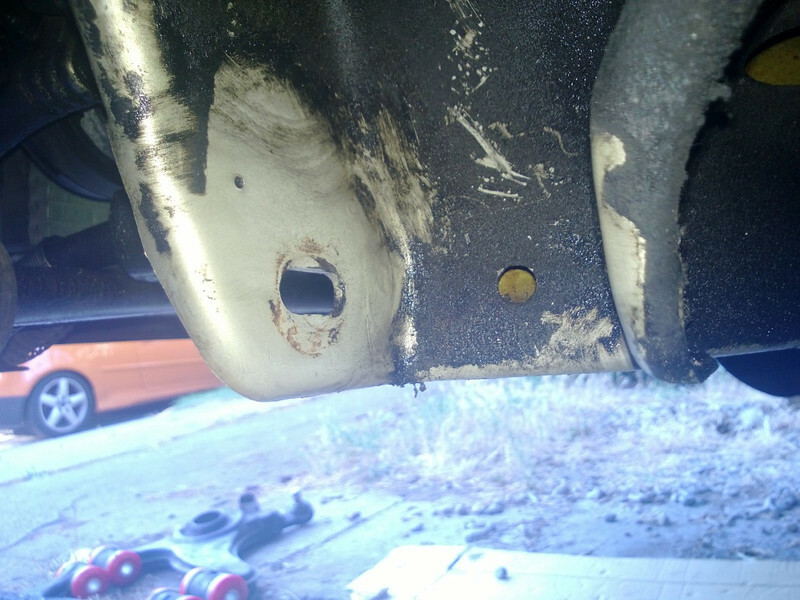 I wound up leaving the accumulators underneath the car, the little fittings to the hard lines were too stubborn, figure I'll try again when I'm ready to pull all the hard lines out. 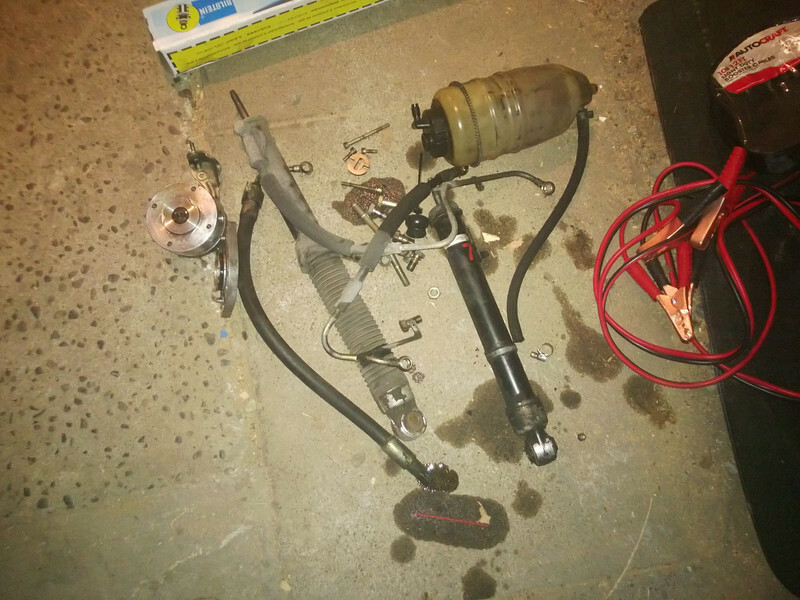 Here's the pile of parts I wound up with, AFAIK the shocks are on their way out but the pump should still be good. Once I had it all back together, I took it out for a little spin. 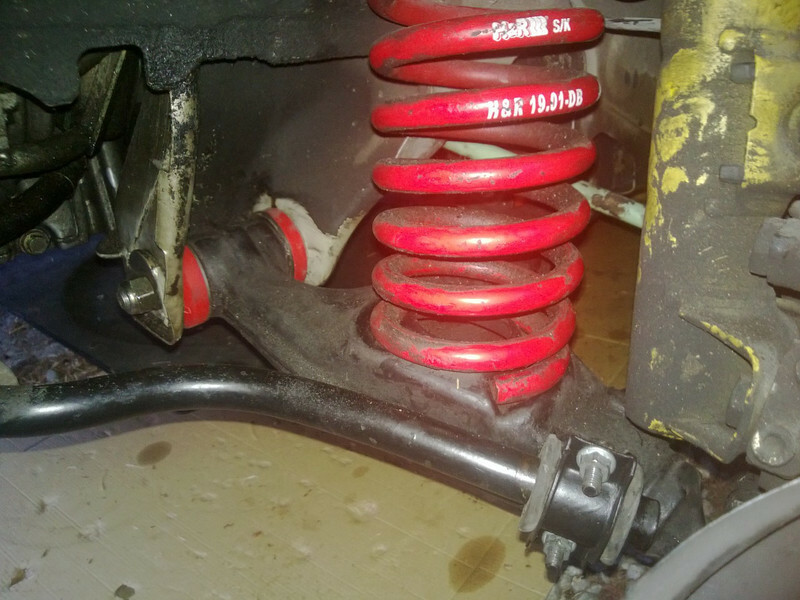 The new shocks in the back feel much nicer with the lowering springs in the rear. sweet. Pulling VC's is usually pretty easy. I need to pull mine on the M3 soon, I think. My neighbor Sean traded the SC300 he got for free for a 190e. Unfortunately his is an automatic and the previous owner spray painted it silver and taped a spoiler from a BMW on the back. Cool cars. It's currently getting the head gasket replaced. Awesome! Do you know what he's got under the hood? And I removed the passenger seat. I got a 20% off coupon code to Wine Country Motorsports from Hooked on Driving so I took the opportunity to pick up a pair of black OMP WRC seats and silver Schroth 6-pt harnesses. That plus not having to pay sales tax saved me quite a bit After I get the front refreshed I'll be bringing the car to 425 Motorsports to have them fabricate some seat mounts and get everything installed. ^^ My messy apartment (I just moved a couple week ago), and my new ultra-realistic Forza setup. those seats are nice.. a step up from my OMP seats. I don't think those harnesses have a DOT label? Just something to be aware of if you're pulled over. Running them with factory 3 points gets kind of difficult. It's a 2.3 with just a single cam I believe. I don't think they do...looks like Schroth's Rallye harnesses are the only ones that are DOT approved. But I'd rather just run harnesses on racing seats than try to use the factory 3 points with seats they weren't designed to work with. yeah.. I'm running the rallye harness in my car. it's just something to be aware of. They'd be legal in Europe I'm sure, but every now and then some cop decides to nail people for using a harness without a DOT label. Definitely something I'll keep in the back of my head. Maybe the silver color will make it less obvious through the windshield or something. Two new flex discs for the driveshaft, and a set of front wishbone bushings. New balljoints and "race" (harder) polyurethane bushings from Hedgehog Tuning over in Thailand. Went over to the garage tonight and got the front left wishbone installed and bolted in. I still have to torque the nuts on the eccentric bolts, but the wheels have to be on the ground to do that so I'll wait until I get the tie rods replaced. I started on the right side wishbone as well but ran out of daylight before working everything into place. Finally got it back on its wheels! Got the right side wishbone all bolted in, then went about replacing the tie rod assembly, which really wasn't in that bad shape. Oh well, good to know I have spares now. Fired it up, put it on ramps, shut it off to torque the eccentric bolts....aaaand then it decided it wouldn't start. Even if I had the GTI hooked to it, or if I had my jumpstarter... so the battery is sitting for the night on the trickle charger and I'll head over there before work to try again. EDIT: That did the trick, fired it up this morning and drove it to work to give it a good run. Last edited by ExplosiveToaster; 2013.08.12 at 15:42 PM. The WRCs and harnesses were installed last week at 425. I'm the first 190 they've made jigs for, so I got a bit of a discount on those... Seats are super comfy, albeit a weeee bit big for that interior (big shoulder wings mean no B pillar trim anymore!) They also performed an alignment so the car drives very well now, and probably even better once the rear bushings are all refreshed! I tracked down my battery drain to either the OVP relay or something on its circuit, which contains all the fuel injection and ABS systems I have a second OVP relay so I'll give that a shot sometime. On the drive home from my friends' house, something went wrong and I bent a valve, so an AAA trip later it's sitting at a shop and I'll at least have them see how bad it is. yeah.. my Champs barely fit in the M3. I've seen WRC's in E36's.. but I think the trim had to be removed as well. Yeah. The car was running pretty well beforehand and I might've gotten a little too happy on the throttle in the 90 tunnel. Didn't money shift or overrev it, but I heard today that after probing around with a stethoscope, the problem is actually in the bottom end...so it's a bent rod and not a valve. Took it over to Car Tender since they know old German cars and they've seen my car before. They're going to put it up and remove the oil pan to inspect the bottom end tomorrow...I'm hoping the block is still OK.
bummer, sorry to hear. Hopefully it's as easy as dropping the pan and replacing a couple bearings! Nope! Engine's toast. I watched the tech drain the oil out and it looked like someone dropped glitter in the engine...and then the tech found a chunk of something in the oil pan when fishing around with a magnet. 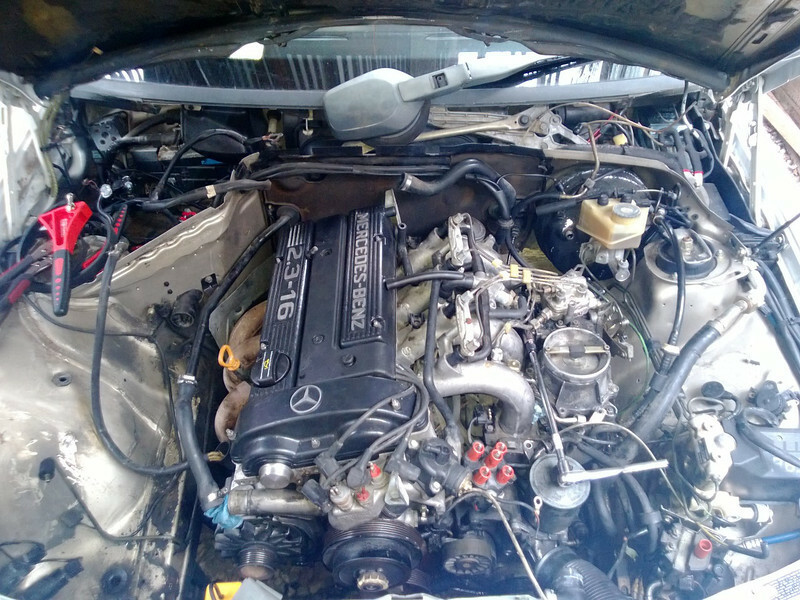 Luckily they found a few 16v motors on the west coast that are younger and were running, so it looks like that engine rebuild I wanted to do somewhere down the line will take place earlier than I thought. Now I'm debating if I want to just leave it at the shop and have a new motor inspected and installed, or have the car towed to my garage and start my rebuild project early. Which also leaves me with an empty engine bay to really get in there and clean out the crud. I agree with the rebuild... might as well not waste the time and money on a temporary engine. Slowly coming along, haven't been updating much since there's not a lot of interesting stuff happening yet. 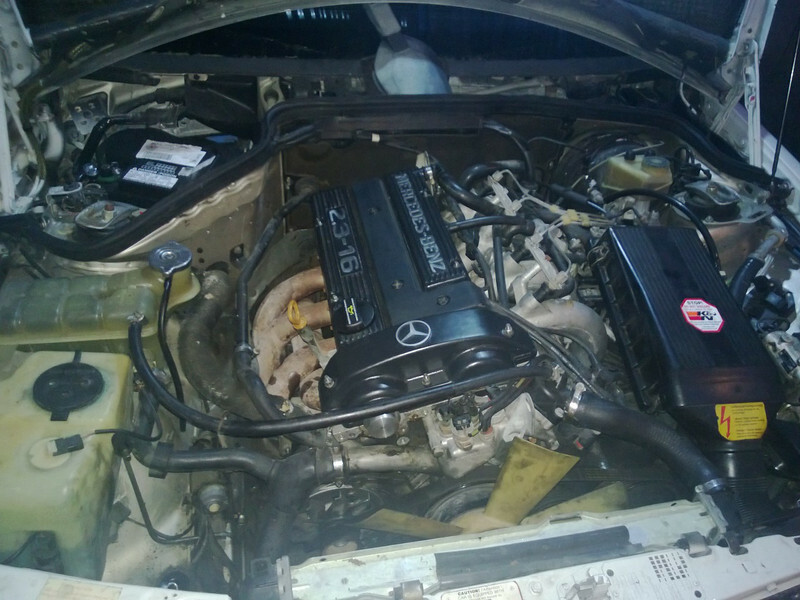 I've just been slowly working my way through the engine bay disconnecting and removing parts in preparation for pulling the motor, I'm getting down to the last few things (unhooking the PS pump, AC, oil lines, transmission cables, shift linkages, transmission mount, exhaust manifold, and engine mounts). I've got the main wiring harness off and most of the vacuum lines, fuel and coolant lines disconnected and/or removed. The engine bay is looking a lot emptier now! Keen eyes might observe the stock mechanical fan wasn't removed so much as broken off. It's held in by 1 bolt, which I removed, but it absolutely would not come off without a lot of "coercion." Not a huge problem, I'm putting in a beefy electric fan later on anyways. I do have a 1-ton shop crane and an engine stand ready to go once I'm ready to do the pull. Even did a bit of remodeling in the garage by removing some shelving to make space, so I should be able to pull the car inside once I sell off the original seats. Last edited by ExplosiveToaster; 2013.09.15 at 16:16 PM. so what's the plan for the engine? Internals-wise, I'm sorta torn. The "race" version of my motor could do 320hp, so that's my target. It's easily possible if I put a turbo on it, but I already have a turbo car I take to the track and this is meant to be a high-revving NA motor. I'm also curious if plumbing in a Rotrex blower would be a happy medium. My ORIGINAL plan was to do the EFI conversion over the winter and see what stock internals + the converted intake mani, then get it dyno tuned and see what that combination could produce before deciding on FI vs. NA. I know I'll be buying pistons one way or another but that can commit me to one path. Last edited by ExplosiveToaster; 2013.09.16 at 23:22 PM.